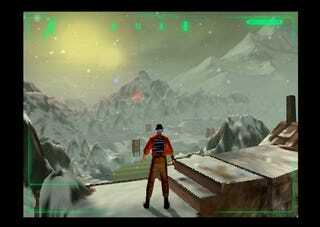 Today, Outcast was released on retro downloadable games service Good Old Games. It's only $6, so I'm going to recommend it to almost everyone. And not because it's a good game. No, the thing that struck me after returning to Adelpha was how ahead of its time it was, something you can only notice having left the game on the shelf for over ten years. You boot it up and yes, the graphics are a little crude. But only a little. The game was released in 1999, don't forget, so those rough, pixellated edges can be excused. Look past those (and the game's slightly iffy character models) and you'll find a world that's, well, beautiful. What you notice almost instantly, though, even before the graphics sink in, is how modern it plays. It's world feels (relative for the time) as open as Oblivion's (well, maybe Fallout 3's). It has a smooth, capable camera system to help you navigate that world, better than anything Rockstar has managed in the intervening years. The AI of your enemies is often frightening, as they team up, using both sight and, more impressively, sound, to take you down. There are even impressive little gimmicks that I've - sadly - rarely seen since, like your map unit actively scanning the environment in front of you (a green wave passes over the terrain, slowly adding your surrounds to your map) and the game's save system being built around sound; you equip an inventory device to save, and when activated, it beeps, which will alert nearby enemies. Sticking with aural delights, the game even had a streaming orchestral soundtrack, performed by the Moscow Symphony Orchestra, which - sticking with the theme for the day - blows away most soundtracks you'll find in games today. Now, this isn't a review. I'm not going to sit here now and break down every single thing I love and hate about the game. I just thought I'd point out that - ironically for a game based around the premise of travelling to parallel worlds - if you felt like playing a 1999 game that plays like it's from 2009, Outcast is a good one to get. It just goes to show that to make a "modern" game, you don't always have to sit down and come up with new ideas. You can always find an old game that was ahead of its time - and went on to be largely ignored - and use those instead. Lord knows it's the least this amazing deserves!